To say Andy Glass keeps himself busy is an understatement. In addition to his YouTube channel Glass Impressions, he has a full-time day job, and does woodwork (of various kinds) in his “free” time. This is all while he juggles family life, which includes a wife and toddler at home. But perhaps we should start at the beginning. 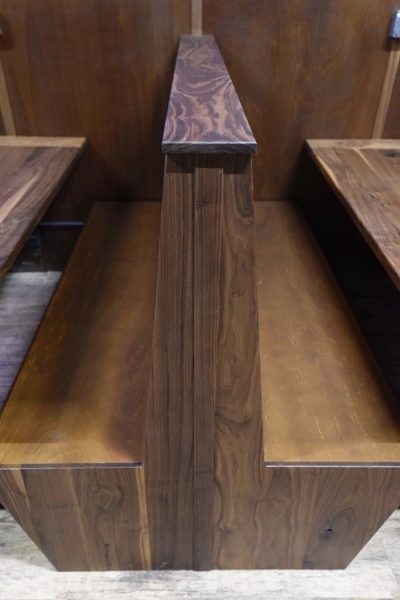 Ever since he can remember, Andy has loved woodworking and making things. At age 7, he was already making birdhouses—and it progressed from there. He claims he has the “maker gene” courtesy of his grandfather. Although he only knew him once he had been retired, Andy’s grandfather was a master cabinetmaker and master homebuilder. Retirement didn’t stop him from working, he still had a beautiful shop at his home in St. Cloud, MN. When Andy’s family would go to visit, 5-6 times a year, he would spend 110% of his time in the woodworking shop with his grandfather. He wasn’t always in there building things of his own, though. 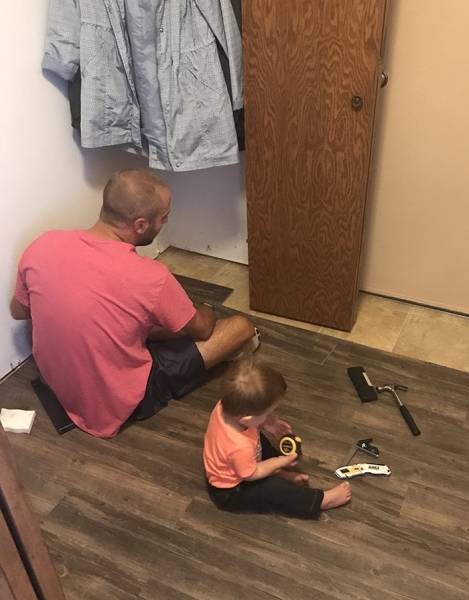 Often he’d be in there helping his grandfather build things for other people, holding his hammer or helping him in whatever way he needed. The most memorable thing he learned from his grandpa? 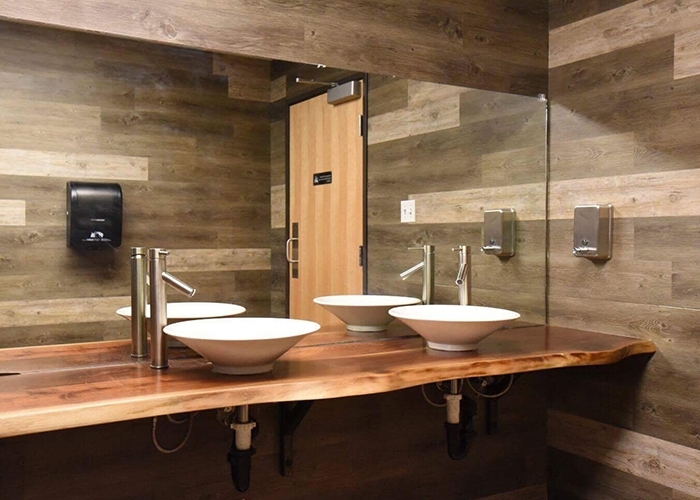 Efficient use of materials. Andy was working on a project and needed to cut something from a scrap piece of wood. He plopped the measurements down, right in the middle of the piece of wood. His grandfather stopped him, “Why make two cuts when you can move your measurement down to the edge and make one cut?” he asked. Something so obvious as an adult, but as a 6-7 year old, not anything you even consider to get the job done. 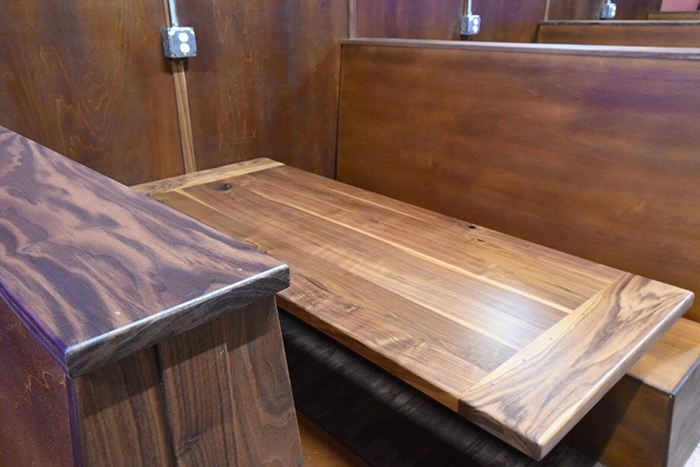 The only formal woodworking education Andy has is from high school classes in construction and woodworking. Instead, he took what his grandfather had taught him and continued with self-education. He used everything from books to online videos, read other online content and magazines and, as he likes to put it he “learned by making.” That includes making mistakes too. 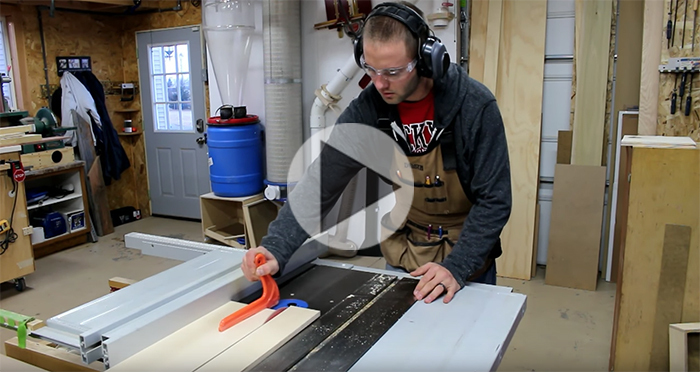 While working on projects in the standalone shop he had at home in Bismarck, ND, he decided to grab a camera and film one throughout his process. That first project? A Shopmade Blast Gate for 4” PVC dust collection piping. He posted it online and things took on a life of their own. 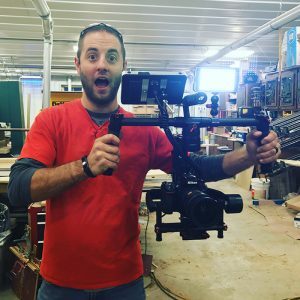 The video was getting hit after hit, and because of his business and entrepreneurial skill set he came to the realization that there was value in what he was doing. It was from here that he was able to gather sponsors, which yielded sponsorship money and tools for product endorsements. He continued down this path for about 3 years while working his day job and produced videos when he could. Because he couldn’t devote 100% of his time to it, his competition began surpassing him. After spending some time exploring other opportunities in the realm of video channels and other online arenas, Andy recently decided to relaunch his YouTube channel, Glass Impressions. From some of the comments already coming in on his most recent posts, followers of his original YouTube channel are happy to have him back and are looking forward to what he’ll be doing next. After that experience, he purchased pre-built CNC machines and then it was 100 mph, full-steam ahead into CNC. 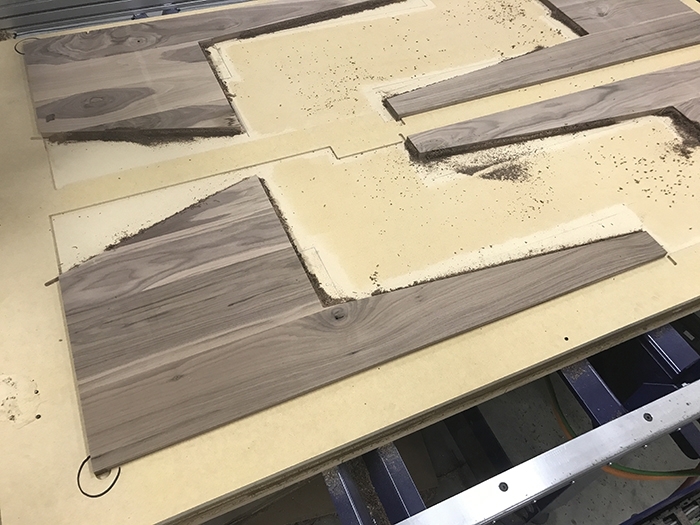 “You have to appreciate the precision, repeatability, and the accuracy that CNC gets you.” He currently has two ShopBot tools. The first one he started using is the Desktop MAX. 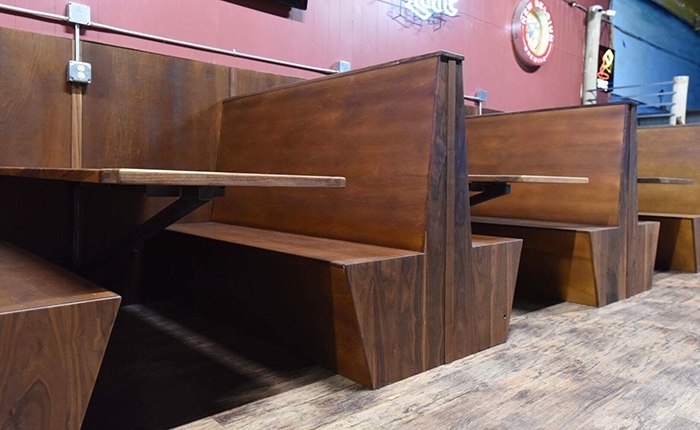 One of the projects he worked on with that particular tool is custom stair treads—a project that he was able to complete by using some custom jigs he made. 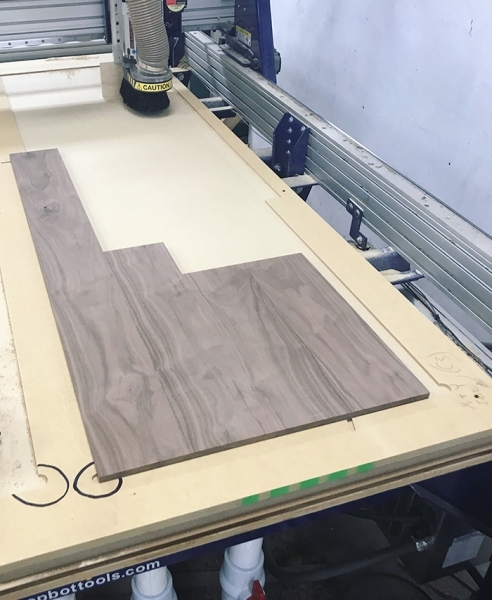 And while he now uses his second tool, a ShopBot PRSalpha with an automatic tool changer, to do the majority of his larger jobs, the Desktop MAX has continued to be put to good use — he’s used it to create cabinets and signs, among other things. SB: What were you doing traditionally that you’re now doing via CNC? Are there things that you wanted to do traditionally that you are now using the CNC for because it makes it easier? 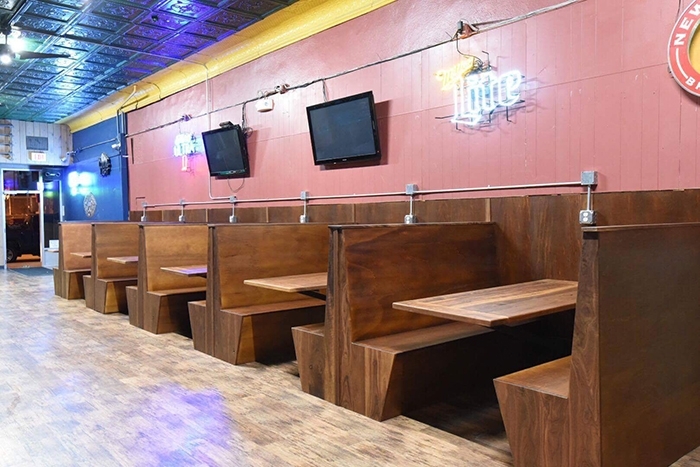 AG: I’ve had a handful of business opportunities and products that have been rattling around in my head since the day I learned how to do woodworking. Coming up with an effective and economical way to do it has always been automation and that technology is CNC. As I moved in progression to where I am now, those opportunities are now becoming a reality. Everything I used to make in the woodworking shop was done in a traditional manner: chop saw, table saw, the router jig or the dado blade for dados and grooves and rabbets, etc. 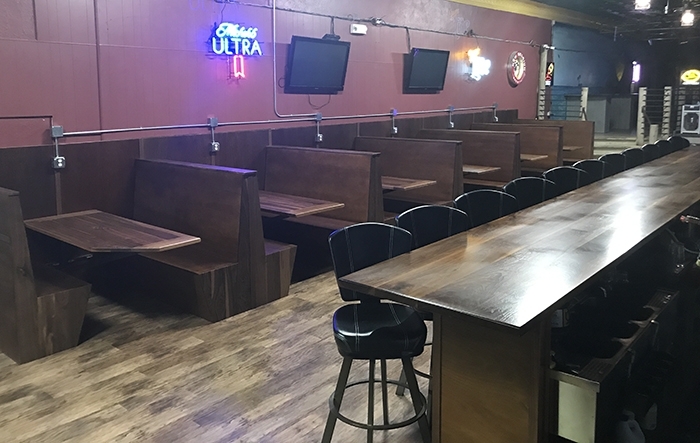 Just this past month, we were doing a huge bar job for a bar/restaurant in Valley City, ND. 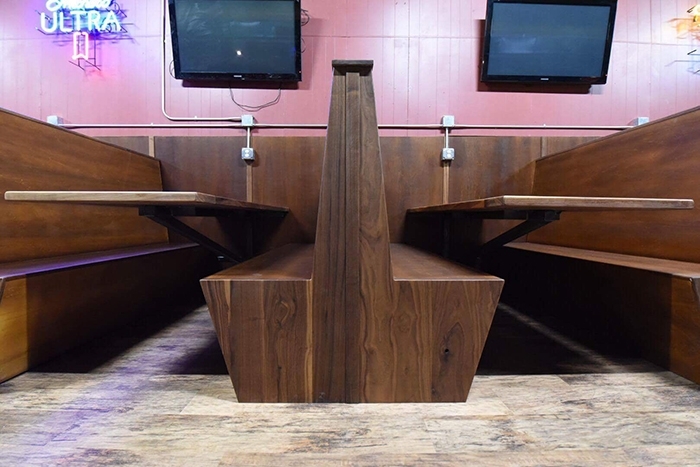 The booth ends are traditional booth ends, but they wanted the end caps in solid walnut and then connected via poplar/plywood that was stained. 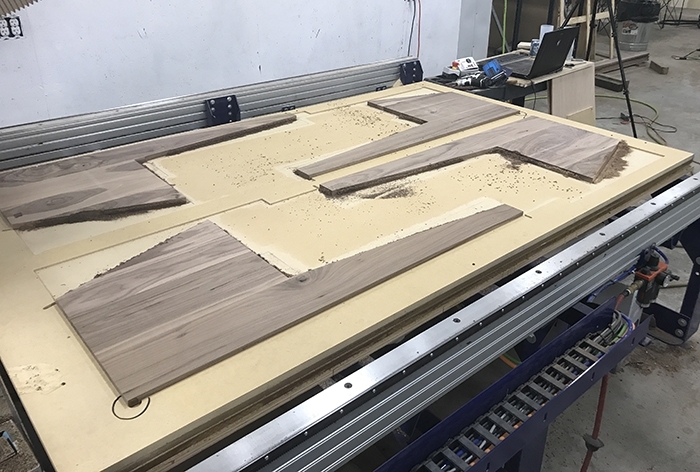 I quickly designed a jig for use in the CNC that could register 4 glued-up walnut panels, and the machine would cut out the booth profile and add a 1/8” rabbet where it needed to connect the plywood—and I had them all done in under 3 hours (24 ends). This is just an example of how in the short couple of months having the machine, it has saved an enormous amount of time in the shop. 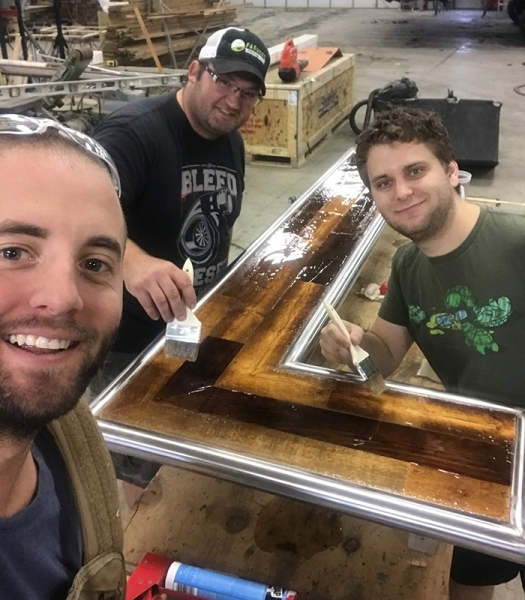 This project is something that is not out of the realm of traditional woodwork capabilities, but it would have taken well over 2-2/12 days to complete this component. SB: You mentioned using a jig for the booth ends, and you used one for the stair tread project. Do you find yourself building a lot of jigs for your projects or is it something that you’ve come to realize helps you problem solve? AG: Both. I utilize CNC to make jigs and templates to not necessarily use the CNC on the project itself. 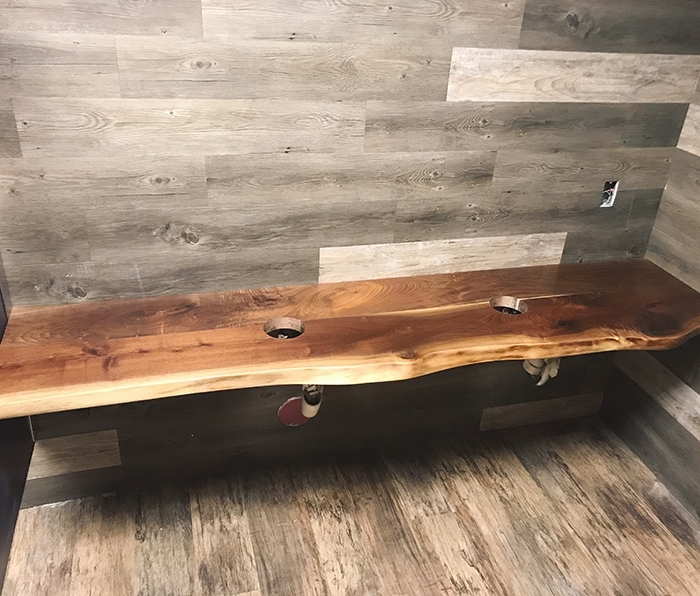 Example: Putting in a live bathroom slab in the women’s room of the bar/restaurant project, we needed a 4 3/4” hole cut out for a vessel sink. 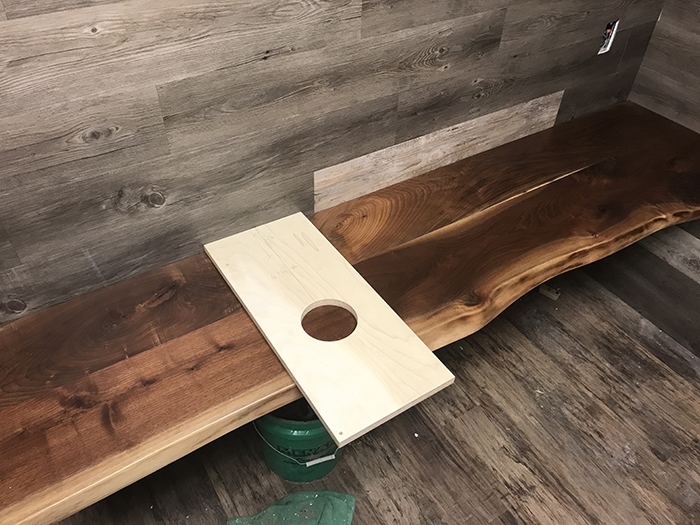 I didn’t want to use the saw on the live slab, so I used the CNC to cut a jig with a 4 3/4” hole in a piece of wood, with the perfect dimensions for what we were doing for the sink. 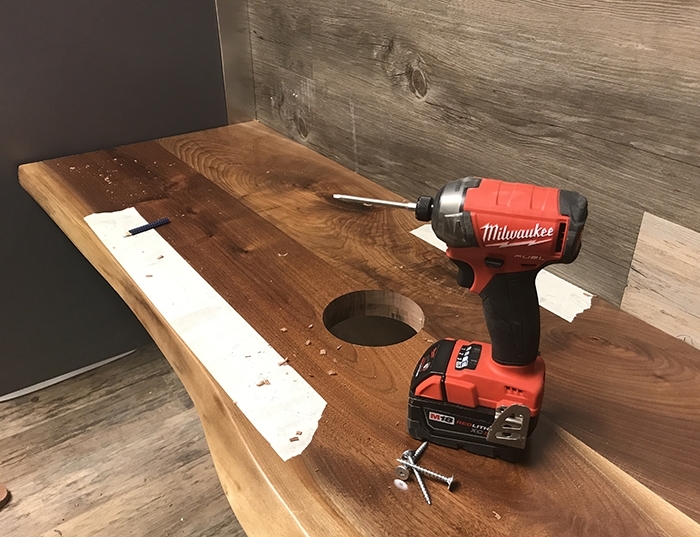 I knew that by doing this and clamping it on top of the slab in the right orientation, we could then use a router with a flush trim bit to cut the slab via the jig/templated hole. An, example of using the CNC in the initial stages of the project, not directly on the project itself. On the CNC/production side (I geek out about this because I’m big on process and habit of workflow – finding a system no matter what it is that you do) find jigs or layout lines or stop blocks, anything that allows you to do repetitive work on the CNC with minimal effort in-between your “go times” is so worth it up front for that capital investment to save you so much time. The jigs developed allow for set-up to do things to take minutes instead of hours. 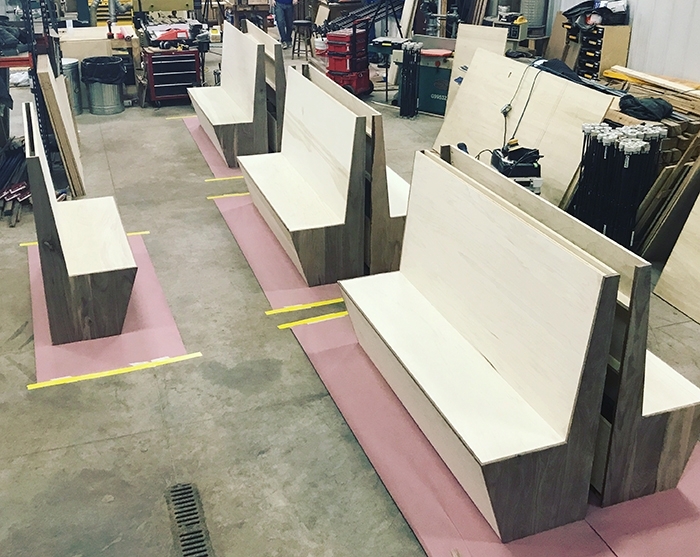 It maintains efficiency and more so, consistency between cuts on the production work – which is essential – and is a must have skill in CNC technology and CNC workflow. SB: What is it that you find you want to do with the tool that you haven’t had the time to do yet? AG: To develop the product line for my new Fargo closets company. I have realized that there is a big gap in the market for reach-in custom closet systems, or closet systems in general that are high quality and affordable (or relatively affordable). I subscribe to Mosaic cabinet software, and have been playing around with the software creating projects, and they are just sitting in a queue, waiting to be made. 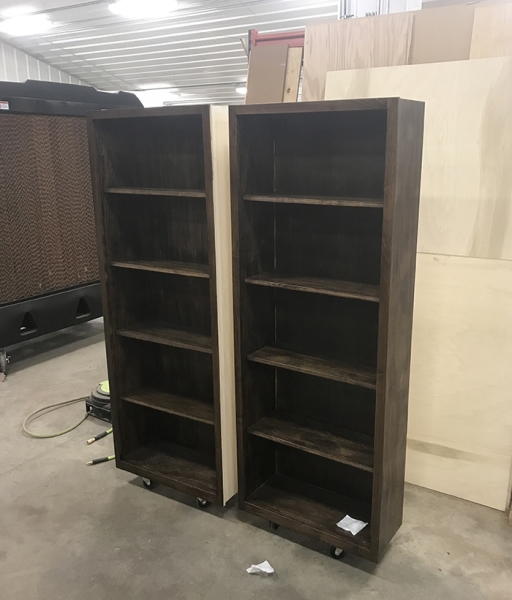 My father has contracted me to build the closets in his new home in Fargo, and the general design person, interior/industrial designer that is working with them on everything did a walk through of the house with me (and my step-mother) telling me exactly what she wanted for each of the closets. I know it’s achievable via Mosaic and the ShopBot. Kitchen cabinet quality with more budget-friendly pricing. It’s all about quality. The ShopBot CNC has me so excited because I can’t wait to get done with the bar/restaurant job and get my Fargo Closets company going. I see myself possibly transitioning out of having a “day job” and doing this in my spare time to actually making it my full-time job.